Ivanka Trump Speaks With CNBC's Joe Kernen Today On "Squawk Box"
Joe Kernen: welcome back. Are we ready welcome back. We are here with Ivanka Trump, adviser to the president and a special guest Robert Felder which is a mechanical -- you’re in mechanical engineering. Everybody says we need more stem. You do stem. I’m going to be a communications-- it’s hard. 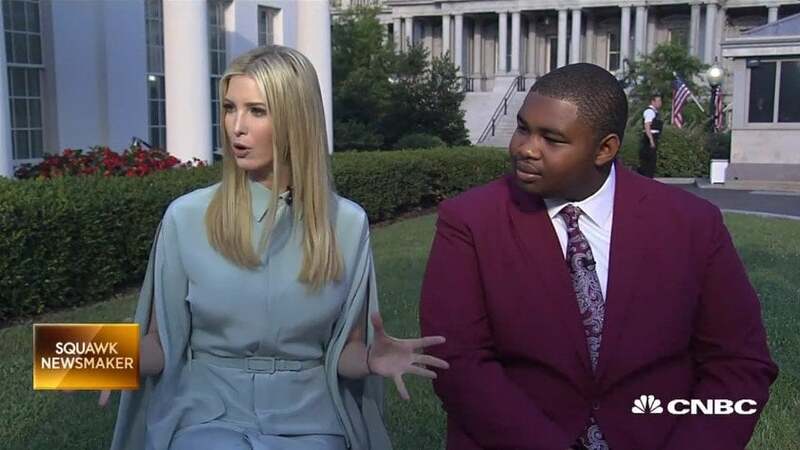 Ivanka Trump: not only that but Robert – I was just with him in Syracuse New York at a p tech university camp -- p.Tech is a high school program where -- it’s part of actually what we’re doing and what we’re focused on in terms of skills development and job training and vocational education, but Robert graduated this spring from p.Tech, from the high school, with 20 degrees towards his college education and is planning to be – why don’t you tell it, joe. Felder: like Ivanka was saying. I graduated from the p.Tech program. I was part of the first class and I graduated with 28 college credits towards my degree work. I’ll be going to Alfred University to study mechanical engineering. Kerenen: there’s no education opportunities for people over 25, really. Trump: as a country by and large, all investment in education stops at the age of 25 and that doesn’t work in such a fast changing increasingly digital economy. So this council is going to focus on taking a holistic approach to skills development, whether it’s k. Through 12 or whether it’s through mid-to-late career workers and bring all of government together to device a national workforce strategy and we’re calling on the private sector to step up. Some of the best programs are programs like Roberts where industry comes into the school and says these are the jobs we need, please train our students with these skills and we’ll employ them. Kernen: I know there’s a goal in terms of corporate participation that you far exceeded. Trump: these are each individuals, all new programs, whether it’s new jobs for people leaving high school and going directly into the workforce or it’s re-skilling opportunities for older employees who are at risk of losing their job to automation. These are all new commitments. We had a goal of 500,000 and we have blown that out of the water. So today we’re going to have industry and have trade associations, we’ll have representatives from small business and they’ll be coming to the white house and signing what we call a pledge to the American worker and this starts today but it’s going to continue for the months and years to come, because ultimately we want business to step up to the plate and recognize that the most important role they can play is helping to promote and advance their own workforces and therefore the country as a whole, so we hope to all of your viewers, we hope you’ll step up to the plate, you’ll sign the pledge an amplify some of the great works so many companies are already doing to invest in skills training and create new and better opportunities for American workers. Trump: the best work is happening out in the states and it’s when the states, city, local governments, they team up with the private sector, the community colleges, the technical schools, the universities, team up with industry and they create curriculum and they train students in that curriculum and the employers hire on the back end. What we can do as a federal government is, a, amplify that work through legislation like Perkins career and technical education , which we’re seeking to pass and reauthorize in the coming weeks, but we can leverage big data. What’s amazing is today there are 6.6 million vacant jobs in this country. There are 6.1 million unemployed workers but there are many outside that have figure who are just outside of the workforce who have given up and are on the sidelines are now coming back into the workforce which is really exciting. When you think about the 6.6 million vacancies how can we leverage government data to inform people what industries they’re in geographically where are those jobs located and maybe most importantly, what are the underlying skills to fill them. Right now all we can say is, which industries have vacancies, but we can’t say where the jobs are located or what the underlying skills are to fill those jobs in those industries. Kernen: what we can do with big data now and with enterprise software and everything we read about every day, companies involved with that, I don’t know why it hasn’t been applied to this. Trump: and think about how will this empower parents and students and workers to make smarter decisions about where they spend their money in terms of career and education and how they spend their time. If they know what skills are in demand and what jobs are available and so some states have done a better job at creating transparency but this is never been done on a national level. We’re working with industry to change that. Kernen: keep us updated. We’ll hear more and more about it. You saw Wilbur’s excited about it. Kernen: it’s hard to tell when Wilbur is excited. Trump: he’s very excited and today’s announcement will be amazing, so Robert’s going to be joining us for it. Kernen: a lot of math, Robert. It’s worth it, though. I found with math, you put the time in, it’s like eureka, it finally starts happening -- good luck to you. Trump: having spent time with Robert, that won’t be a problem. Kernen: I had a problem on my side. Good luck, thank you and we’ll continue to have some conversations about this -- and you were watching earlier. You got a tv set you can watch the rest of the show. Trump: We will watch the rest of the show, so we always do.